I had an agenda upon my return to Venice, a city that I loved to the point of idolatry. My first trip there I thought, ‘Oh, yes, I will live here someday.’ I imagined that I would create art among incredible beauty underscored by a forced simple life (probably the only way I could attain simplicity). But on my second visit, Venice had changed. I planned to do a series of photographs there featuring an antique doll that looked remarkably like myself and that I called “Mini-me.” But she fell off the balcony our first day there (suicide?). I took it as a sign. The second day, my husband and I ventured fourth to begin our walk through all of Venice. But more than what seemed like 80 percent of the city was covered in graffiti. No magnificent building had been left unscathed. Vile, comical, stupid graffiti. Some homeowners had tried to paint it out again and again. One graffiti artist randomly marked over another (at least I thought it was random). I was heartbroken. My Venice was gone. Instead I saw bitterness, anger, and mindless vandalism. It was really depressing. 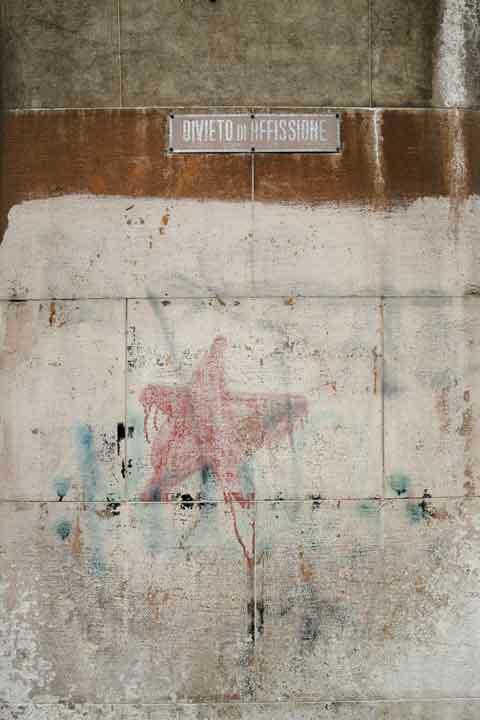 It turns out that graffiti is believed to originate in Italy. The origin of the word comes from the Italian “graffito,” to mark or scratch on a surface. Evidence of graffiti was found on ancient ruins, such in as the Catacombs of Rome and on the walls of Pompeii. In contemporary graffiti, there is a hierarchy of markings; a graffiti etiquette of sorts. A more profound or creative mark can go over a lesser tag or mark. The idea of appropriation of property is a central theme for the graffiti artist, and that the property is in public view is important. There is a need to draw attention to a viewpoint or an image or a tag representing the artist’s identity. I felt that by capturing on film these marks and the history of worn surfaces, I was appropriating the appropriated. Also, now, I was leaving my own mark. This is the historic process. I was becoming part of Venice ’s accumulative story told on its walls. The worn surfaces of buildings also became a major part of my attention. 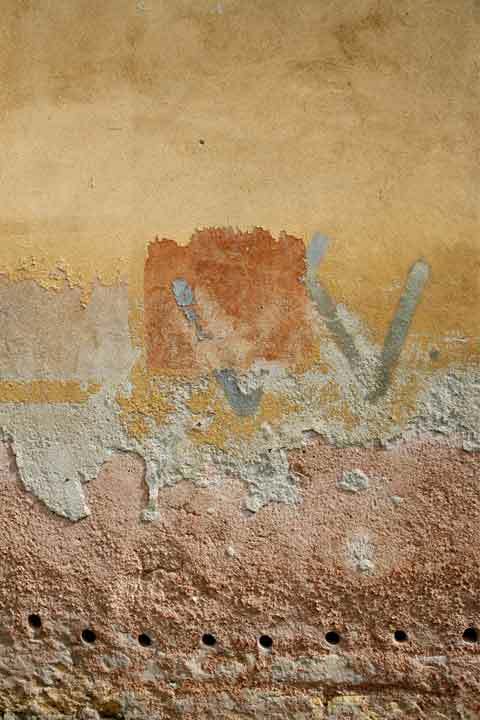 The painted and repainted, worn and deteriorated surfaces built so many years before tell the story of the transitional nature of life; we, too, are becoming worn out; we, too, have our scars. This return to Venice showed me so much about life, about myself, about our need to be heard. But it especially taught me about life’s unique contradictions. Many of the photographs I have captured speak to cultural ambivalences, those contradictions that happen, for example, when within the graffiti the word “assassin” happens to fall next to an embedded shrine of Mary and the Christ child. The unconscious combinations of things, words and emotions that happen over time, played out on these surfaces, are unknowing collaborations. Even the images of objects randomly staged in windows bring surprising comedy, as well as ambiguity. I have introduced the photography to mixed-media paintings with encaustics and oils. By inscribing my own markings into the wax, I am a contributor to the history of these wonderful surfaces.